It is the hunter’s responsibility to ensure they understand all the rules and regulations for hunting elk in New Mexico; please consult the current New Mexico Rules & Info booklet before hunting. Hunters must be properly licensed to hunt elk on private land. The E-PLUS program distributes private land elk authorization certificates to landowners. Landowners may transfer the authorization certificates to hunters or their agents. A hunter may use an authorization certificate to buy a private land elk licenses for specific elk hunt. There are two types of authorization certificates. These are ranch-only and unit-wide. A unit-wide authorization certificate allows a hunter to buy a unit-wide private land elk license. Unit-wide hunters are allowed to hunt legally accessible public lands and unit-wide private lands within the boundaries of the Game Management Unit (GMU). A ranch-only authorization certificate allows a hunter to buy a ranch-only private land elk license. Ranch-only hunters are restricted to the private land within the boundaries of the ranch. No public lands may be hunted using a ranch-only private land elk license. In GMUs 4, 5A, 46, 55A, and 55B ranch-only hunters are allowed to hunt on other private lands within the GMU with written permission from the landowner. Private land elk authorization certificates may be obtained from landowners who have been issued them for the current hunting season. Any arrangements for authorization certificates are between the landowner and hunter. Hunters may check the E-PLUS landowner lists, by following the links below, to find landowners who have been issued authorization certificates. These lists are provided as a courtesy from the Department of Game and Fish. They are normally updated each year in May-June. There are three different E-PLUS landowner lists (below) that hunters can use to find landowners who have been issued authorization certificates. 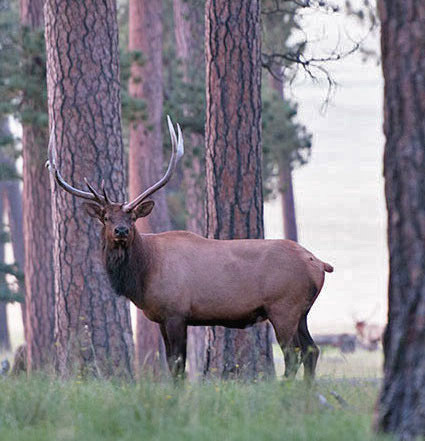 The Landowner List– These landowners have been issued one or more authorization certificate for their land that is within the Core Occupied Elk Range (COER). The SCR Landowner List – These landowners were lucky in the Small Contributing Ranch (SCR) drawing and received a single authorization certificate for their land that is within the COER. The Outside the COER Landowner List – These landowners have received authorization certificates for their land that is located outside the COER. For additional information and instructions about buying a private-land elk license, you may also visit the Licenses and Permits section of this website or consult the current New Mexico Rules & Info booklet. Harvest reporting is mandatory for all licensed elk hunters. The deadline to file a harvest report for an elk license is February 15th. Harvest reports filed after this deadline will be subject to an $8 late fee. Licensed elk hunters who do not report will be ineligible the following year for all special entry hunt applications, population management authorizations, and private land authorizations.